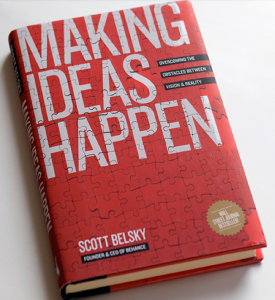 Perhaps no book in recent years has been more helpful for those who want to get it done than Scott Belsky’s Making Ideas Happen. We all have ideas, even good ideas. What sets the people with lots of ideas apart from successful ideas is turning them to reality. You have ideas that you want to make happen. You can develop the capacity to make ideas happen. Making ideas happen = Ideas + Organization + Communal forces + Leadership capability. Organization enables you to manage and ultimately execute your ideas. The forces of community are invaluable and readily available. Fruitful innovation requires a unique capacity to lead. Traditional practices such as writing a business plan—ultimately a static document that will inevitably be changed on the fly as unforeseen opportunities arise—must be weighed against the benefit of just starting to take incremental action on our idea, even if such early actions feel reckless. Taking action helps expose whether we are on the right or wrong path more quickly and more definitively than pure contemplation ever could. It is not naïve or a cliché to say that the creative mind holds the answers to all the world’s problems. It is merely a fact. And so you should balance your desire to use your creativity with a sense of responsibility. Everybody’s abuzz about the book, Manage Your Day-to-Day, by the folks at 99U. 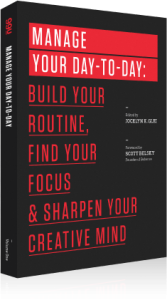 The subtitle—build your routine, find your focus & sharpen your creative mind—pretty much describes the insides. For those of us drawn, for whatever reasons, to the productivity, self-help, get-creative, work-smarter books, this one hums. It’s succinct. 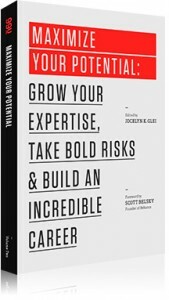 Editor Joycelyn Glei found 20 folks (for example, Seth Godin, Tony Schwartz, Scott Belsky) who write deeply about their assigned areas and gave them four or five pages to bring us honed advice. “The best way to predict the future is to create it,” Peter Drucker said. And that’s at the heart of Maximize Your Potential. It’s the second of a three-part series being developed by 99u. This compact book comes from the folks who don’t want to help us get more ideas (we’ve got plenty), but do help us make our best ideas become reality. The volume focuses on creating opportunities, building expertise, cultivating relationships and taking risks. As in the first volume, if you’ve read any personal growth books at all, you’ll get compelling and condensed reminders of things you should already know. If you haven’t read the other books, start here. The writers also help us understand growth in new ways. Will and discipline, it turns out, are highly overrated. We each have one reservoir we draw on, and it gets progressively depleted each time we use it to get something done…. A ritualized approach to practice helps conserve our precious and finite reserves of energy. …It was only after I began studying the science of high performance that I started building a new sort of practice ritual. I still sit down at my desk first thing in the morning when I’m working on books, but now I write for exactly ninety minutes at a time—not eighty-five and not ninety-five. Then I take a break. I may get something to eat, close my eyes and spend ten minutes breathing reply, or take a run, each activity in order to refuel and recover. The heart of achieving mastery, I’ve come to believe, is expanding the amplitude of the waves you make in your life. When you’re working, give it everything you’ve got, for relatively show periods of time. When you’re recovering, let go and truly refuel.